Welcome to "Inu Goya"! With a name meaning "kennel", you can bet that I'll be using my 'net effectively to round up every bit of stray Inu information I can find, and collect it all in one convenient place. Feel free to look around for anything you like. I use only trustworthy sources, so you can be sure that these dogs know how to go on the paper. "Inuyasha" has completed. Thanks for watching! Shogakukan has begun a new segment called "Hero's Comeback" where new content for a retired series is periodically published. A new stand-alone Inuyasha chapter will be published in the 2013-10 issue of Shounen Sunday, on 2/6/13. It will also be released as part of a compilation book with other authors in March, with proceeds going towards reconstruction of the areas affected by the March 2011 tsunami. Despite the majority of Inuyasha Kanketsu-hen relying on stock background music from the previous series, episodes 25 and 26 will contain all-new pieces written by Kaoru Wada, potentially making the final two episodes fully-scored with their own original soundtracks. The third ending of Inuyasha Kanketsu-hen will be "Tooi Michi no Saki de" ("Down the Distant Road") by Takekawa Ai. So far a starting date has not been announced, but it is listed on the upcoming "Inuyasha Best Song History" music collection as Kanketsu-hen's third ending. Viz has changed their schedule so that the weekly episodes of Inuyasha Kanketsu-hen will now be uploaded to ShonenSunday.com on Mondays rather than Saturdays. 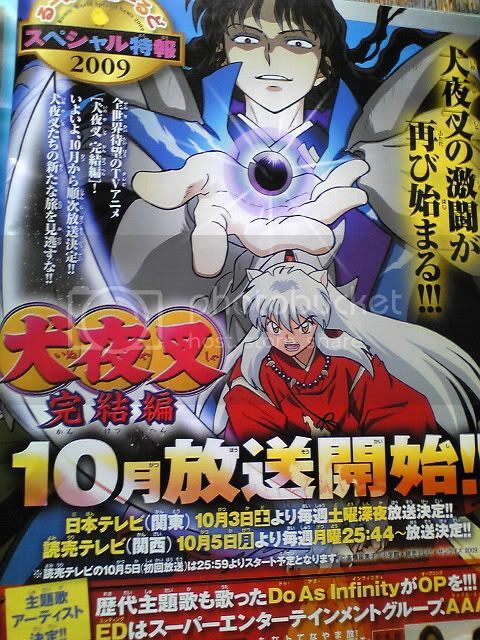 Inuyasha Kanketsu-hen's new ending theme, "Diamond" by alan, will begin on December 5th with episode 10. Viz announced at the New York Anime Festival that it intends to simulcast Inuyasha Kanketsu-hen (under the English title "Inuyasha: The Final Act") on its Shonen Sunday website and on Hulu.com beginning Saturday, October 3rd. The new season of Inuyasha will begin airing in Japan on the 3rd of October on Nihon TV and on the 5th of October on Yomiuri TV. The opening will be performed by Do as Infinity, while the ending will be performed by AAA. It's not an unfounded rumor this time. 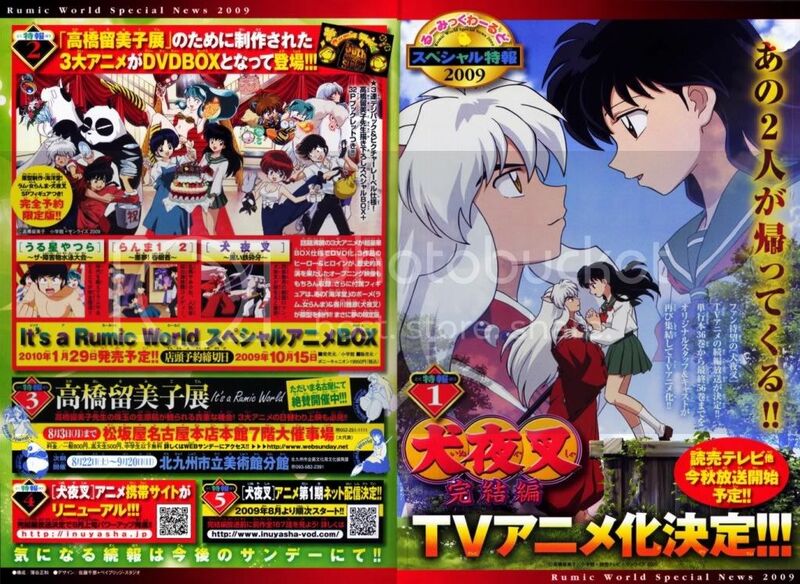 New Inuyasha episodes under the working title "Inuyasha Kanketsu-hen" will begin broadcast this fall in Japan, picking up where the original series left off and running through to the manga's end. The fourth Inuyasha movie is tentatively scheduled to play at 11:00 on December 23rd on Cartoon Network. Inuyasha will cease running new episodes on Adult Swim for the next two months, and will resume with episode 158 on October 11th at 12:30, at which point it will be running daily until the end of the series at episode 167. The third Inuyasha movie, "Swords of an Honorable Ruler", will tentatively premiere on August 12th at 11:00 on Adult Swim. Didn't have a whole lot of time to throw something together this year, but the April Fool's version of the site can be found here. The fourth Inuyasha movie, given the English title "Fire on the Mystic Island", will be released on DVD in the US on August 1st. The three new character singles have been given titles. Naraku's song is "Rakujitsu" ("Sunset"), Kagome's is "Tatta Hitotsu no Yakusoku" ("Just One Promise"), and Bankotsu and Jakotsu's is "Abarero!" ("Go Wild!"). The first two Inuyasha movies will air back-to-back on December 24th at midnight. New episodes will begin premiering every Tuesday night at 12:30 starting January 3rd. As usual, this is a tentative schedule that is possible to change before then. Another round of character image songs is being released to three CD's on the 25th of January. The characters to be featured this time around are Kagome, Naraku, and Bankotsu and Jakotsu. Viz has put up an extensive site for their release of the third movie, "Swords of an Honorable Ruler", linked at the bottom. It contains an English trailer and a list of dates and cities where it will be getting a free theatrical screening. The second movie will show on Adult Swim on Cartoon Network at midnight on the 27th of August, and then rerun at 3:00am that same night. The new episode of the series will be pushed back to 11:30 for that night. The PS2 fighting game, "Inuyasha: Feudal Combat", is set to be released on August 15th. While it's not yet confirmed whether the game will have a Japanese or English voice track, the American trailer for the game contains the original Japanese voice track. The three character single CD's being released on the third of August now have track information. Each will contain one song, a karaoke version of the song, and a message from the cast. Inuyasha's CD will be titled "Aoki Yasei o Daite" ("Embrace the Blue Wild Life"), Miroku's will be "Kaze no Naka e" ("Into the Wind"), and Sesshoumaru's will be "Waza" ("Deeds"). It turns out that the "Character Song Singles" will indeed be released as 3 single CDs, one per character (or group of characters). The three CDs will be "Inuyasha (feat. Kagome)", "Miroku (feat. Sango and Shippou)", and "Sesshoumaru (feat. Jaken and Rin)". Sale date for all three is still the 3rd of August. Finally. For a series of the nature of Inuyasha, it's EXTREMELY surprising that something like this hasn't come out before now, but now a "Character Song Single CD" has been announced to be released on the 3rd of August. The fourth movie, "Guren no Hourai-jima", will go on sale to the public in Japan on August 26th. The first movie has been bumped back a week, showing on May 21st at midnight. The following week on May 28th, new episodes will premiere every Saturday at 11pm starting with episode 102. The third movie, given the English title "Swords of an Honorable Ruler", will be released to DVD in the US on September 6th. Apparently those who get it early also get it wrong. The site that claimed that the fourth movie would go on sale in June was in error, and the date they gave was actually the rental date. The sale date of the fourth movie will again be in August, as it has been in the past. The upcoming PS2 fighting game is going to get a rather quick release to the states, with a tentative American release date of sometime in August, bearing the title "Inuyasha Feudal Combat". No specifics on a Japanese release have been given yet, though the rumored release date there is June 16th. Yeah, that time of year again. ^_^* Yesterday the site boasted a bit of fake information, including all the news one the main page, the summary and review of chapter 403, and the set of "Dear Papa" responses (not that they were "fake", they were just the set that would have otherwise been skipped this week). Everything is back to normal now, and the April Fool's site has been archived here. The Japanese release of the fourth movie, "Guren no Hourai-jima", to DVD will be June 10th. This is apparently the release for SALE rather than rental, which is two months earlier than the normal August releases for the previous movies. An actual date has finally been given for the broadcast of the first movie on Adult Swim: May 14th at midnight. A "Competitive Fighting Game" for the PS2 has been announced for release in Japan next summer. No further details such as titles or playable characters have been announced. Hey, less than a month before their premiere, we finally have a date (which, knowing Cartoon Network, is naturally subject to change). The dub Inuyasha episodes will pick up with episode 79 on Monday, January 10th. New episodes will run three days a week, Monday, Tuesday, and Wednesday. A two-disc compilation of the best BGM from the TV series and movies will be released on March 16th. From December 24th to January 9th, there will be a survey held where people can vote for which tracks they want on the CD. Starting November 11th, Thursdays will become "Premiere Repeat Nights", which will re-run the new episodes of Fullmetal Alchemist and Ghost in the Shell that premiered the previous Saturday. Doing this deletes a day from the weekday run, making it so the Inuyasha weekday run will not reach episode 79 until January 5th, when new episodes will start airing Monday-Wednesday. The premieres of new Inuyasha episodes on Saturdays will end on October 16th with episode 78, at which point the series will leave Saturday. The show will continue in reruns during the weekdays up through episode 78 again, which will air December 21st. At that point, the premieres will return with episode 79 on December 22nd and continue with the new episodes on weekdays. The first and second movies will show in the spring and summer of 2005, respectively. In a not terribly surprising announcement, the TV broadcast of the first movie has been pushed to spring of 2005, due to requirements of how long a movie has to be on DVD before it is broadcast on television. No, Adult Swim still won't be showing the original openings when the new episodes premiere, but since there's been a lot of complaints about it, they've decided to host all the deleted opening and ending sequences on their website, including some that haven't aired yet. Currently available for Inuyasha are the first four openings (including "Grip!" with the English intro narration), and endings 1, 2, 4, and 5. So, if you've only seen the series on AS and want to see what they're cutting, or if you're just really curious to hear that dubbed intro to "Grip! ", the intros/outros can be found in the "Other" category of the "Clips" section.